Many PlayStation 4 owners utilize their systems for a lot more than just gaming. The PS4 can be used to stream movies and TV shows, listen to music and play Blu-ray Discs. Among the many extra features, the PlayStation 4 offers the ability to surf the web via its integrated browser, based on the same WebKit layout engine as Apple's popular Safari application. 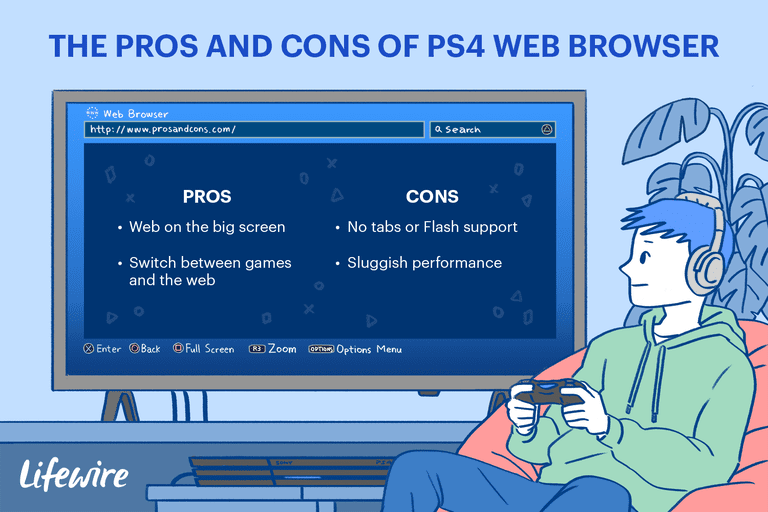 As is the case with its desktop and mobile counterparts, the PS4 browser presents its own set of positives and negatives. The tutorials below show you how to use most of the features found within the PS4 web browser, as well as how to modify its configurable settings to your liking. To get started, power on your system until the PlayStation home screen is visible. Navigate to the content area, which contains a row of large icons used to launch your games, applications, and other services. Scroll to the right until the Internet Browser option is highlighted, accompanied by a www icon and a Start button. Open the browser by tapping the X button on your PS4 controller. If you don't see the WWW icon in the main navigation pane, you can find it in your Library, under Apps. To open a new browser window, press the R2 button. To move to a previously opened window, press the L2 button. To toggle Full-Screen mode on and off, press the square button. Note: The PS4 browser defaults to the desktop version of responsive websites. To zoom in on the active web page use the R3 button. activated by pressing down on the right-hand stick on your PS4 controller. To enter a URL/web address, first press the R2 button to open a new window. Navigate to the address bar at the top of the page, labeled Enter URL, and tap the X button. The on-screen keyboard will now appear, prompting you to enter a web address. Once complete, press the R2 controller button to load the corresponding page. To perform a Google search, first press the triangle button on your controller. The blinking cursor should now be visible in the search box and the on-screen keyboard should pop out directly under it. Enter your desired search words or terms and submit them by pressing the R2 button. When the pop-out menu appears, select Add Bookmark. A new screen should now be displayed, containing two pre-populated yet editable fields. The first, Name, contains the title of the current page. The second, Address, is populated with the page's URL. Once you are satisfied with these two values, select the OK button to add your new bookmark. Return to the browser's main menu via the OPTIONS button. Next, select the option labeled Bookmarks. A list of your stored bookmarks should now be displayed. To load any of these pages, select the desired choice by using your controller's left directional stick and then press the X button. First, select the bookmark from the list and press the OPTIONS button on your controller. A sliding menu will appear on the right side of your screen. Choose Delete and press the X button. A new screen will now appear, showing each of your bookmarks accompanied by checkboxes. To designate a bookmark for deletion, first place a check mark next to it by tapping the X button. After you have picked one or more list items, scroll to the bottom of the screen and select Delete to complete the process. The PS4 browser keeps a log of all web pages that you have previously visited, allowing you to peruse this history in future sessions and access these sites with just the push of a button. Access to your past history can be useful, but can also pose a privacy concern if other people share your gaming system. Because of this, the PlayStation browser provides the ability to clear your history at any time. The tutorials below show you how to both view and delete browsing history. Press the OPTIONS button. The browser menu should now appear on the right-hand side of your screen. A list of web pages that you've previously visited will now be displayed, showing the title for each. To load any of these pages in the active browser window, scroll until the desired selection is highlighted and press the X button on your controller. Press the OPTIONS controller button. Next, select Settings from the pop-out menu on the right-hand side of the screen. The PS4 browser's Settings page should now be displayed. Select the Clear Website Data option by pressing the X button. The Clear Website Data screen will now appear. Navigate to the option labeled OK and press the X button on your controller to complete the history removal process. You can also access the Clear Website Data screen by pressing the OPTIONS button from the aforementioned browsing history interface and choosing Clear Browsing History from the sub-menu that appears. Your PS4 browser stores small files on your system's hard drive which hold site-specific information such as your layout preferences and whether or not you are logged in. These files, commonly referred to as cookies, are typically used to enhance your browsing experience by customizing website visuals and functionality to your particular wants and needs. Since these cookies occasionally store data that could be considered personal, you may want to remove them from your PS4 or even stop them from being saved in the first place. You also may consider clearing browser cookies if you're experiencing some unexpected behavior on a web page. The tutorials below show you how to both block and delete cookies in your PS4 browser. Press your controller's OPTIONS button. Next, select the choice labeled Settings from the menu on the right-hand side of the screen. Once the Settings page is visible, select the Allow Cookies option; located at the top of the list. When activated and accompanied by a check mark, the PS4 browser will save all cookies pushed by a website to your hard drive. To prevent this from happening, press the X button on your controller to remove this check mark and to block all cookies. To allow cookies at a later time, simply repeat this step so that the check mark is once again visible. Blocking cookies can cause some websites to look and function in strange ways, so it is important to be aware of this before modifying this setting. Follow these same steps to return to the browser's Settings interface. Scroll to the option labeled Delete Cookies and tap the X button. A screen should now appear containing the message The cookies will be deleted. Select the OK button on this screen and press X to clear your browser cookies. Advertisers monitoring your online behavior for marketing research and targeted ad purposes, while commonplace on today's web, can make some people uncomfortable. The data aggregated can include which sites you visit as well as the amount of time you spend browsing each. Opposition to what some web surfers consider an invasion of privacy led to Do Not Track, a browser-based setting that informs websites that you do not consent to be tracked by a third-party during the current session. This preference, submitted to the server as part of an HTTP header, is not honored by all sites. However, the list of those who do acknowledge this setting and adhere to its rules continues to grow. To enable the Do Not Track flag in your PS4 browser, follow the instructions below. Press the OPTIONS button on your PS4 controller. When the browser menu appears on the right-hand side of the screen, select Settings by tapping X. Your browser's Settings interface should now be displayed. Scroll down to the Request that Websites Do Not Track You option is highlighted, located towards the bottom of the screen and accompanied by a checkbox. Press the X button to add a checkmark and activate this setting, if it is not already enabled. To disable Do Not Track at any time, simply select this setting again so that the check mark is removed. When the menu appears on the right-hand side of the screen, choose Settings by tapping the X button. The PS4 browser Settings interface should now be visible.